Though comatose H'El is in an astral state, able to see and here everything around him. Jor-El, ten years junior to the one he had known, is running tests on him. Jor along with a fellow scientist, Orla, is astounded to find that H'El has absorbed a massive amount of radiation from multiple sources. He is clearly Kryptonian in physiognomy but carrying levels that must only come from off planet and in the current time that is outlawed on Krypton. Added to their findings Jor discovers H'El has super abilities far beyond mortal man. Psionic, telekinetic and even temporal displacement powers, making H'El a 'super' man. Jor must present his findings at Roa's temple, and despite Orla's skepticism the youthful scientist is eager to show his discoveries. In The Scar, a research facility, Jor offers his findings while an astral H'El watches. The sliver of kryptonite removed from H'El's chest is impossibly powerful, the only way it could be created is if a core chain reaction of epic proportions exploded the planet and supercharged it - a piece of kryptonite that cannot exist unless it came from the future. Hearing the council warn him of treason and refuse to waste more time on his 'entertaining antics'. They dismiss him warning that the discoveries should not be shared publicly. Jor reluctantly agrees and walks out of the boardroom. He is about to return to his laboratory when an old friend of his, Zod, approaches and the two agree to a long overdue catch up. H'El knows of Zod and though he knows little, he does know he dislikes the man. Still the astral subject follows them to Jor's private lab. Zod is surprised at how much Jor has achieved in this hidden sanctum. H'El looks around and feels a familiarity however he has never been in the lab. Then something happens that is unexpected - Jor reveals that H'El's arrival inspired him to catalog Krypton's history through to theorizing future events in light of the kryptonite shard. H'El then realizes it was here that he procured the DNA to clone the dragon he set upon Kal-El when they first met. Jor points out that Zod knows their species is susceptible to high capacity cellular absorption, even though Zod coyly dismisses that. Jor explains he has been looking into possibilities should they ever need to colonize other planets. Thus he has collected DNA, chemical components and cellular samples of nearly all life, and minerals from Krypton's past to see if they can survive a trip in space, one around the galaxy and back. Zor can hardly hide his admiration and questions how he would possibly be able to succeed. H'El is also curious and looks at the plotted star charts. Suddenly something clicks in his mind and a horrific realization sweeps over him. Jor flips the tarpaulin off of a stunning spacecraft. The craft is named House of El or H'El for short, named after legend that argonauts named their crafts during the old Kandorian war. This is H'El's ship. H'El's memories are now no longer clouded, rather they were remnants that were forced into his head during the trip to Earth along with all the samples in the ship. H'El's past wasn't true at all, rather a lie created by his muddled mind in a craft unprotected from stellar radiation. 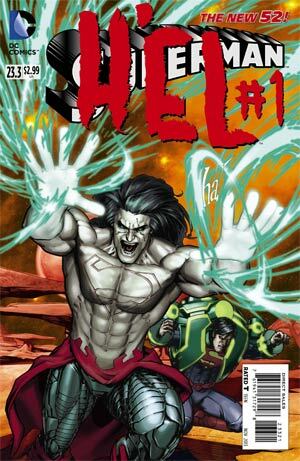 H'El's astral form rejoins its body and lays immediate waste to the lab, killing Orla and the other scientists. Zod is impressed by H'El's thirst for blood, while Jor realizes that H'El has woken only so he can steal the H'El ship and use it and its cargo to wreak havoc across space and time. Zod protects the lab with a laser pistol while Jor initiates a self destruct. Zod is incinerated by a blast of heat vision while H'El enters and introduces himself to his 'father'. Jor also comes to the realization H'El did earlier, H'El created himself in some kind of time anomaly. H'El is filled with rage and grabs Jor by the throat. He destroys the lab computer halting the self destruct, and watches as Jor tries to show him a better way, travel through time, make a difference, positive changes, to perhaps save Krypton. Coldly H'El breaks Jor's neck and throws him next to Zod's charred remains. H'El then picks up the sample of Jor's DNA and alters it with the samples ready for the ship to ensure that he will be born onboard. The ship then soars skyward and off planet. H'El then opens a temporal hole and steps into it vowing to one day rule Krypton. To Be Continued in Action Comics Annual #2. Story - 1: I can't hide my disappointment. The story is a paradox, H'El has been made into a character that can't exist not even as a temporal paradox but I will let the real scientists among you thrash that theory out. The revelation that he created himself to create himself was just awful. I had high hopes for H'El's return and his backstory. With said backstory revealed I am bitterly disappointed in him, his motivation and his future. I am still hoping the "Return to Krypton" story will fare better and I hope I'm not setting myself up for a fall there. I was intrigued by the interaction between young Jor and Zod. Exploring that would be something great. Art - 4: A visual spectacular. I really enjoyed the issue's art, it was suitably atmospheric. Cover Art - 4: H'El looks great here. A real threat for Superman to contend with. This is a much more menacing cover than the last two Superman #23. issues. Bravo Gene Ha! I love this one!